Meet Imagine! 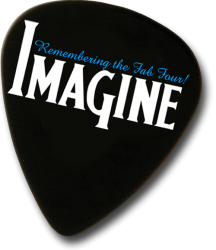 – Imagine: Remembering the Fab Four! Born in Manhattan Beach, California, Tom was inspired at an early age when he saw the Beatles for the first time back in Feb. 1964. He says, “I found my purpose in life — to sing, play guitar, and make young birds scream. It gave me ‘vision'”. Since that time, Tom learned to play guitar, bass, harmonica, piano, and sing. He is truly fulfilling his “vision” as he tours with Imagine. Tom and his wife, Rosanne, live in Gardnerville, Nevada and are the proud grandparents of 5. When not playing the part of John Lennon, Tom plays in the folk rock group, Shiny Guitars. Richard Fazzi was born and raised in San Jose, California and as luck would have it, a natural lefty. As is the case with so many other musicians, he was inspired by four guys he watched perform on television that fateful Sunday evening in February of 1964. His path in many ways followed the events that led Paul McCartney to becoming The Beatles bassist. Rich started with four years of formal guitar lessons and when he joined his first band, they had no bass player and nobody wanted to play bass so he said “Ok, I’ll try it”. After getting his first bass, it quickly became his first love. He wasn’t planning on doing any vocals, but again, no one else wanted to sing so he said, “Okay, I’ll try singing.”. 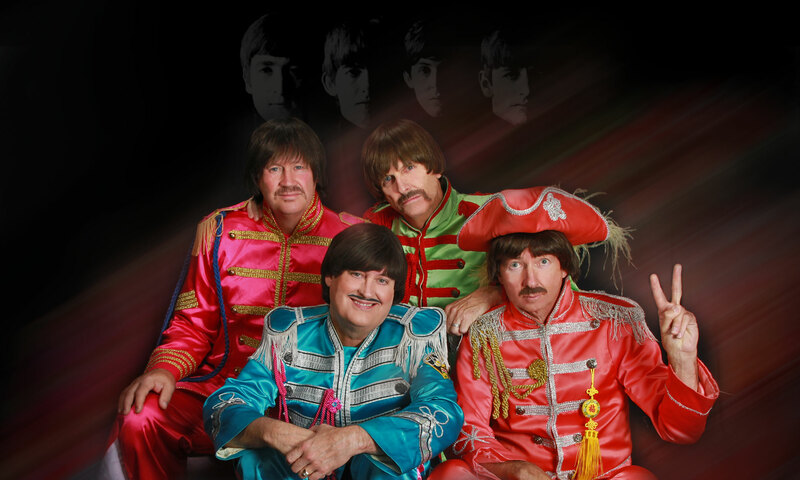 Rich has years of recording and touring experience playing many different styles and has been a member of several Beatles tribute bands. In addition to playing guitar and bass, he also plays keyboards. Rich lives in Albany, New York with his wife Vonda. Brad has had a love for the music of the Beatles as long as he can remember, but it wasn’t until he was 16 years old and finally heard Sgt. Pepper on a good stereo that he was truly hooked. “I heard the bass in the song “Lucy In The Sky With Diamonds” and asked the question, “What is that instrument?” It wasn’t long after that he bought a bass guitar, joined a band, and now it’s all this! “My first paid gig was New Year’s Eve (in a bar) when I was 17. I had to get a letter from some council member in order to be there”. Since that time Brad has performed with such notable acts as The Drifters, David LaFlame, Freddie “Boom-Boom” Cannon, The Coasters, The Crystals, and the infamous Salt Lake area group, Spanky and The Wankers. Brad can occasionally be found darning his socks, in the night, when there’s nobody there. Mark Robinette (Ringo Starr): Began his musical career in San Jose, California, playing professionally at age 14. His eclectic musical tastes have motivated him to learn many instruments and many styles. He has played with the Mamas and Papas, Natalie Cole, Frankie Avalon, Bobby Vinton, Donny Osmond, and the Temptations, to name a few. He has played with the touring casts of Broadway shows including Chicago, The King and I, and Annie. His company, Accent Productions, produces entertainment events around the country, including the Orange Bowl Halftime show in Miami. He is in demand as a music director, arranger, and teacher. The experience of studying Beatles songs note for note has given him great respect for the craft of songwriting. He resides with his family in beautiful Kaysville UT. Eric is in high demand as a sound engineer with credits including the Smothers Brothers, Rich Little, Collin Raye, Peter Noone (Herman’s Hermits), the Osmonds, Tony Danza, David Archuleta and many others. He has extensive experience in musical theater, live televison and corporate events. Eric started his association with Imagine in 1994 mixing sound for their shows on the carousel stage at Lagoon Amusement Park. Since then he has been with them on tours including the Sugar Bowl Half time show at the Superdome in New Orleans, Fresno County Fair opening for Jay Leno, and the Shanghai Music Festival in China. Eric has four children and three grand kids. Eric says, “I’m thankful for the support of my wife, Ann”. He and Ann live happily in Layton, Utah. Michael Huff is our Musical Director for Symphony Shows. He wears a lot of hats, owing to his versatility as a conductor, pianist, teacher, arranger, and show producer, and his uncommon comfort with nearly all genres of music. Michael has been a guest conductor with the Salt Lake Symphony and American Festival Orchestra and has worked with recording artists like B.B. King, Sara Evans, Clint Black , LeAnn Rimes, Alabama, K.C. & the Sunshine Band, The Temptations, Lee Greenwood, The Commodores, The Spinners, Sandi Patti, Diamond Rio, The Isley Brothers, and BIG & RICH (to name a few). A regular collaborator in all this work is Michael’s wife, Susan. They look back on over 30 years of marriage and music-making, with countless performances of all kinds, and six children whose ages range from 14 to 26, and whose interests and energy are the focus of their family life.